A demented killer is on the warpath and only Wallander can stop him: "Mankell at his best . . . If you haven't bought Sidetracked, do so ASAP" (Los Angeles Times Book Review). Inspector Kurt Wallander's long-anticipated vacation plans are interrupted by two horrific deaths: the self-immolation of an unidentified young woman and the brutal murder of the former minister of justice. As the police struggle to piece together the few clues they have, the killer strikes again and again. What connection is there between a retired minister of justice, a successful art dealer, and a common petty thief? Why does the killer scalp his victims? And could there be some connection between the young woman's suicide and the murders? 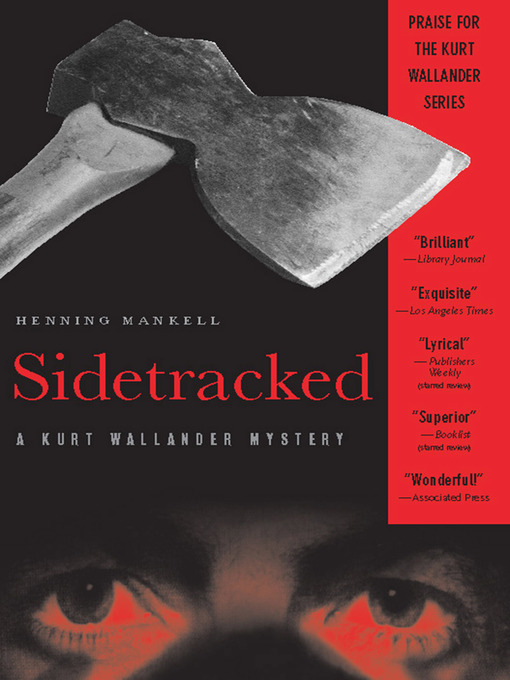 Sidetracked, winner of the Best Crime Novel of the Year in Sweden, is an outstanding entry in the series that inspired the BBC program Wallander starring Kenneth Branagh. Mankell, called "the King of Crime" by The Economist, infuses police procedural with a searing critique of contemporary society, from the disintegration of the family and the exploitation of women to corruption and scandal at the highest levels of government. "Connoisseurs of the police procedural will tear into this installment like the seven-course banquet it is" (Kirkus Reviews). Henning Mankell's Kurt Wallander mysteries are global bestsellers and have been adapted for television as a BAFTA Award–winning BBC series starring Kenneth Branagh. Mankell was awarded the Crime Writers' Association's Macallan Gold Dagger and the German Tolerance Prize, among many others. He divides his time between Sweden and Mozambique. Told from the perspectives of both cop and criminal, Mankell's third Kurt Wallander mystery revolves around the veteran Swedish inspector's search for a savage serial killer who scalps his victims after delivering a fatal hatchet blow. The novel opens as Wallander is called to a farmer's field, where he helplessly witnesses a teenage girl's self-immolation. The suicide unsettles the inspector, who can't understand why someone so young would kill herself. As the police try to identify the young woman, the serial killer's first victim, a former justice minister, is discovered on a beach in a wealthy neighborhood. Three more people are found murdered and scalped, and other signs of violence suggest that the perpetrator is becoming increasingly agitated. Following standard procedure, Wallander and his crew try to link the four victims, all male, a difficult task because their lives never seem to have intersected. Using American profiling methods as well as his own intuition, Wallander struggles to make headway in the case. What he doesn't consider, and what readers know, is that the murderer isn't a man but a boy, who hopes to revive his catatonic sister by the ritual presentation of the scalps. Mankell's meticulously detailed descriptions of the inspector's investigation--and his often lyrical portrayal of Wallander's struggle to rearrange his thought processes in order to catch the criminal--are masterful. The author's treatment of modern themes such as juvenile killers and broken families adds richness to what is essentially a straightforward police procedural. But above all, the novel stands out for its nuanced evocation of even the peripheral characters. Winner of Sweden's 1997 Best Crime Novel of the Year, this is another terrific offering from the talented Mankell.